This enduring compressor design has been the favourite of millions throughout the years. With a six gallon tank capacity that has been electro statically painted for years of use, powerful 3.5 HP electric motor, oil reservoir creates 115 PSI and has output levels of 5.2 CFM at 40 PSI and 4.2 CFM at 90 PSI, allowing it to operate many air tool for extended periods of time without the worry of recycle time. The PCE6060K incorporates dual pressure gauges and brass quick connect couplers meaning that changing tools is a breeze, even in the middle of a job, while the handy handle and mobility kit allow the job to be almost anywhere there is electricity available. The Campbell Hausfeld 30 Gallon 3.7HP horizontal portable air compressor (VT6104) powers a variety of air tools for the serious do-it-yourselfer, professional, or contractor. Product life up to 5,000 hours. Durable and safe ASME code tank for greater storage. The cast iron pump delivers 10.2 CFM at 90 PSI and is designed for long life and durability. The Hulk silent air compressors are designed to provide all power with little noise! The oil free, dual piston 2 cylinder pump with low amp draw and solid copper winding's allows for less wear and tear. These commercial grade pumps are designed with heavy gauge steel cylinders, cylinder head and valves for maximum durability and reliability. Providing 5.29 CFM @ 40 PSI and 3.24 @ 90 PSI and an amazing 37 DB @ 3 ft. away! General Solid cast iron cylinder air compressors are built to withstand the rigors of the home, farm, and job-site. Designed with heavy users in mind, most models are portable and are designed for hand-carry or are wheeled. The AC1104 is Ideal for dusting, inflation, air brushing, stapling finish nailing and can operate air ratchets, small impact wrenches, air hammers & spray guns. In addition, the powerful 2HP AC1104 is strong enough to operate small grinders & sanders. It's 11 Gallon, compact vertical tank takes up less space in your garage or shop. A top rubber grip handle and 6 inch oversized wheels makes it easy to move from one job to the next. Operating at 6 CFM @ 40 PSI & 4.8 CFM at 90 PSI, this small compressor packs a punch! Automatic thermal protection overload guards against low voltage drops and power surges. Contractor grade compressors can be utilized for a myriad of purposes, but are primarily engineered to power nail-guns. The Husky 38 L Electric Wheeled Air Compressor features a heavy-duty, 1.5 HP induction motor and a long-life, oil-lubricated direct drive pump. The compressor delivers 135 max PSI and 3.8 SCFM at 90 PSI, making the unit excellent for a number of DIY home or shop tasks including light-duty automotive tasks, all trim and finish applications with nailers and staplers, medium-duty heavy nailing tasks with framing and roofing nailers, as well as all of your inflation needs. The 7-inch wheels offer maximum portability, while the vertical configuration creates a smaller footprint that takes up less space, storing easily in the corner of your shop or garage. 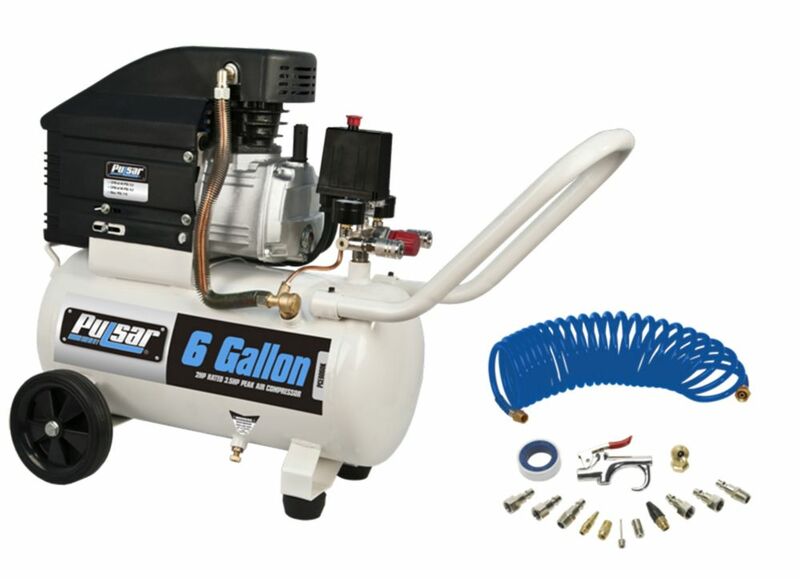 Pulsar 6 gallon Air Compressor with kit This enduring compressor design has been the favourite of millions throughout the years. With a six gallon tank capacity that has been electro statically painted for years of use, powerful 3.5 HP electric motor, oil reservoir creates 115 PSI and has output levels of 5.2 CFM at 40 PSI and 4.2 CFM at 90 PSI, allowing it to operate many air tool for extended periods of time without the worry of recycle time. The PCE6060K incorporates dual pressure gauges and brass quick connect couplers meaning that changing tools is a breeze, even in the middle of a job, while the handy handle and mobility kit allow the job to be almost anywhere there is electricity available.